Coincidence is a funny thing. 1. When looking into programming a web application, I found a product by Intel (#GrinnellConnection) that completely reshaped my plan for programming my MAP app. 3. My meeting last week with Professor Purcell led to us looking at the app for HistoryPin, which is solving a great deal of my design issues for my app, as it also deals with historical memorabilia and mapping. In any case, here’s what is going on with my projects! My MAP continues to chug along nicely and the prototype is working pretty ok so far. I’ll definitely be checking with my computer science-minded classmates to see if they have any suggestions or tricks to make it work better. My basic (so far!) programming skills seem to be working out well, though. It’s exciting to see what used to be indecipherable code take on meaning. I can see some patterns and understand a little better what is happening behind the scenes of my websites. 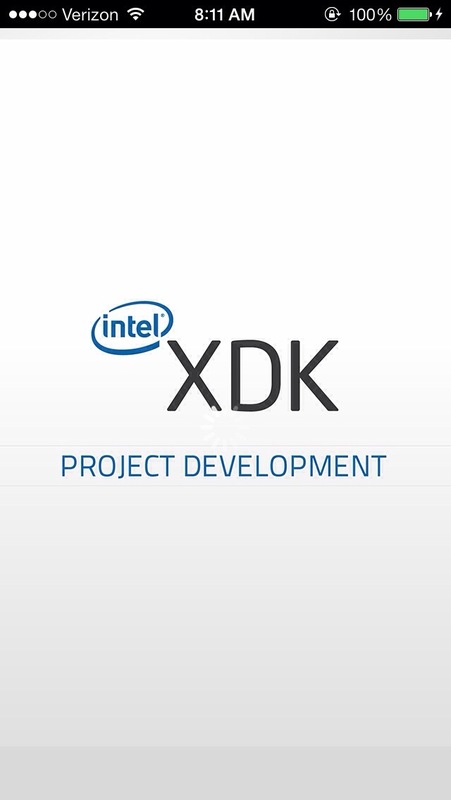 The development software, the Intel XDK, is pretty incredible. It contains a coding suite, design software, testing, and software packaging for the major app stores. It also lets users code in HTML5 instead of other languages, which is great for a beginner like myself. Another awesome feature is the ability to stream the app directly to my phone for direct testing, which is super useful to make sure each new feature works. 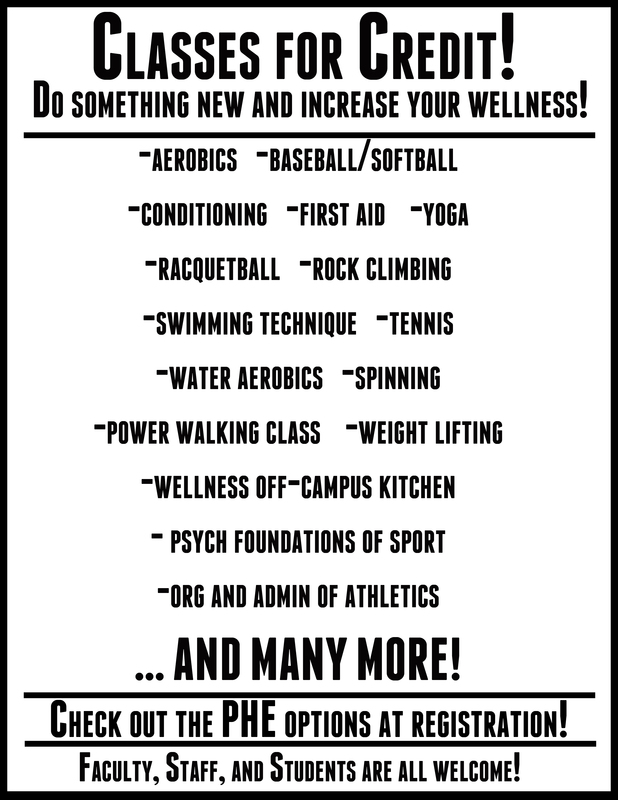 On the Wellness Tech front, I’m working on developing some public awareness posters based on survey data from the student athletes this fall. It’s an exciting project and I enjoy putting the data into a more visual form. Jen Jacobsen and I are also working on a pilot project to use smartphones as wellness-enhancing tools! I’ve been using myself as a guinea pig to test out various fitness tracking apps and wellness-oriented apps to see what may work for college students. My current favorite is “Balanced” which was recommended to me by Professor Davis. It focuses on reminding you to practice good regular habits with minimal reminders. I’m enjoying the fact that it hasn’t jumped on the social-for-social’s-sake train unlike many of the other apps I’ve been trying. It also is incredibly simple and customizable. I think it may be the app we’ll be using for our project, I just want to test it for a few more days. Back to the Blog- with updates galore! It’s definitely been far too long since I’ve been writing here. Life has been crazy, but quite wonderful at the same time. I recently finished my final season of collegiate swimming, bringing my fifteen years as a competitive swimmer to an end for now. I haven’t managed to stay away from the pool, however; it still remains an integral part of my workout. I’ve also been hard at work on a variety of projects. (In case you are just joining me, I’ve been working on an independent project to place historical maps and pictures onto the current campus by designing and programming an application for mobile devices.) This has probably been one of the most exciting and fulfilling challenges I’ve had the pleasure to work on. Not only have I been using tons of historical research skills in digging through archives and maps, but I’ve gotten a chance to use the training from my Value Sensitive Design class in designing and reworking my prototypes. Alongside using the traditional education, I’ve been dipping my toes into alternative education by using the well-regarded Codecademy to learn the programming skills necessary to complete the app. I’ve really enjoyed the discussion this dual-education has sparked between my adviser (Sarah Purcell) and I. With the education world currently atwitter (ok, bad pun) about technology and social media in regards to education, it’s enjoyable to be exploring a rather new area of learning. I’ve been wanting to write a cookbook for just about forever now, and am finally doing it! SPARC, the committee in charge of distributing funds to aspiring publication projects, has decided to fund my endeavor to create a “cookbook” based on the Dining Hall. I’ve written a column for the past few years on creative eating in the Dining Hall, and am looking forward to developing a set of recipes for this cookbook from past successes and new experiments. 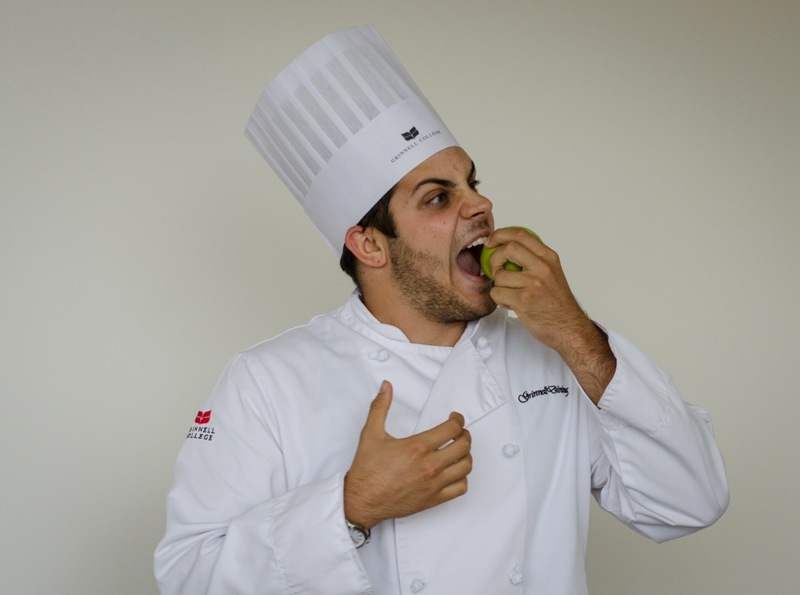 It’s a bit of a challenge, as there is a relatively small range of constant ingredients and the only cooking surfaces open to direct student use are a microwave, toaster, and toaster oven, but I’ve had a great deal of fun and success over my four years here, and can’t wait to put my ideas into print. I’ve decided to set aside time almost every day for a little bit of creative work. I’ve found it helps me relax and work better, plus the results are something I can enjoy later. I’ve been spending my Tuesday and Thursday mornings doing pottery in the student ceramic studio, which has been so much fun. It’s been really enjoyable getting back into throwing, which I used to do in high school almost daily. 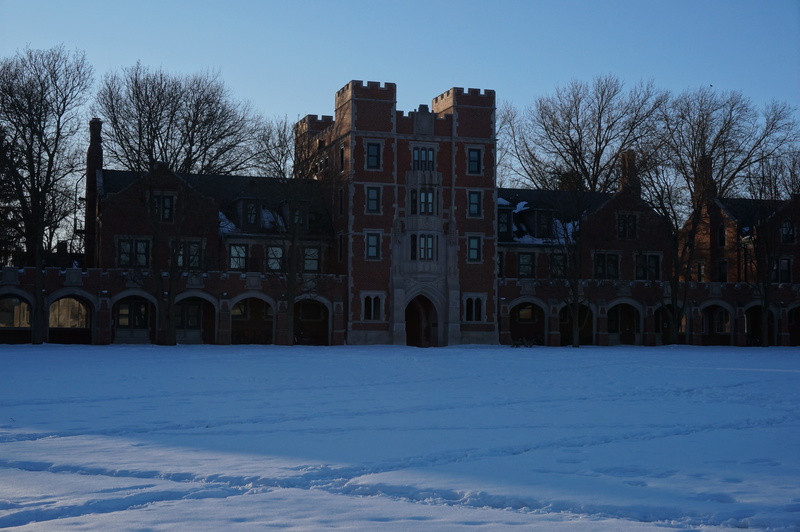 I’ve also been taking pictures of Grinnell’s campus; it may be blisteringly cold, but it sure is beautiful. (Check out the pictures below!) 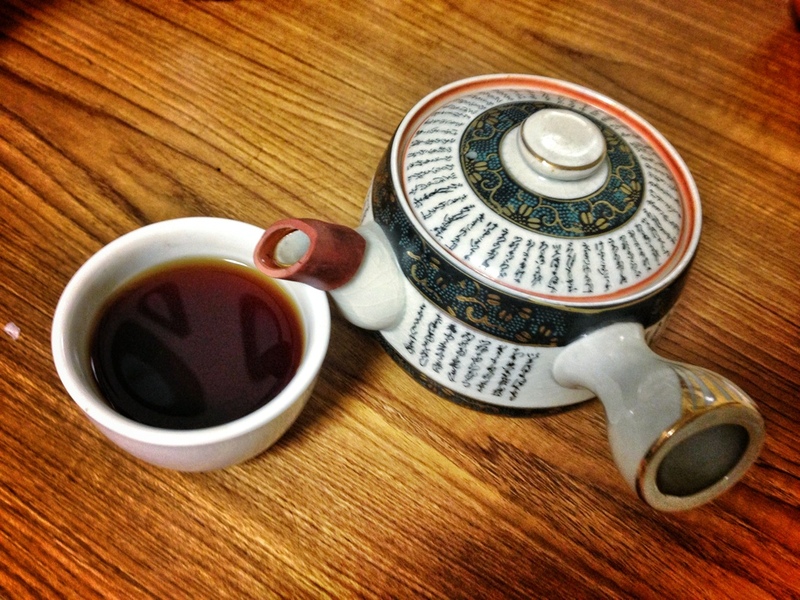 My latest, and newest creative endeavor is food writing exercises. I picked up an amazing book called Will Write For Food by Diane Jacob; it not only has fantastic advice and interviews, but Jacob offers a variety of enjoyable writing exercises at the end of each chapter. It’s been fun working my way through them and seeing different tweaks I can perform on my writing. 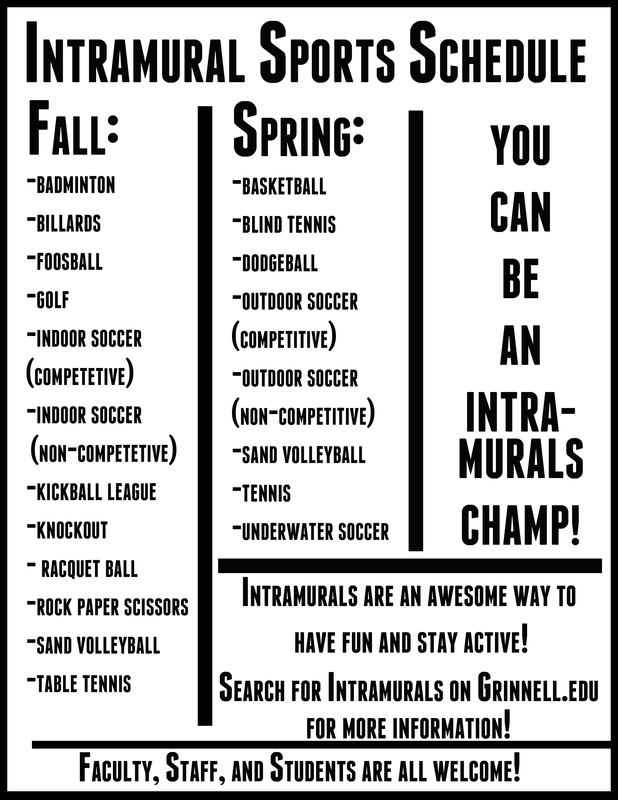 Things have been crazy here in Grinnell, but life is quite wonderful and exciting! On the Wellness Technology Intern (under the guidance of Jen Jacobsen ’95) side of things, I’ve been on quite a design spree. We’ve been planning and executing a variety of events. I’ve also been drafted into another couple of design projects, which are always a fun way to take a break from studying. Our most recent event was Facing the Bear, an evening devoted to making the athletics facility (nicknamed the Bear) as appealing and inviting as possible. 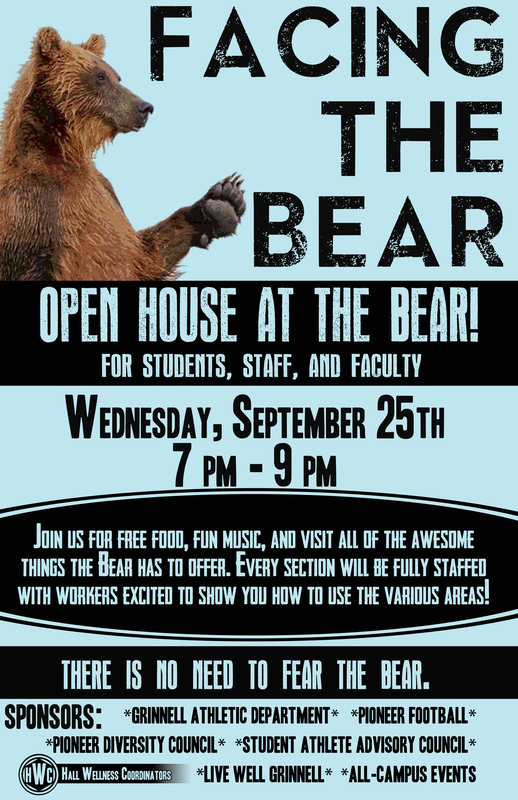 We stocked the Bear with friendly staff, gave tours, and gave away food. 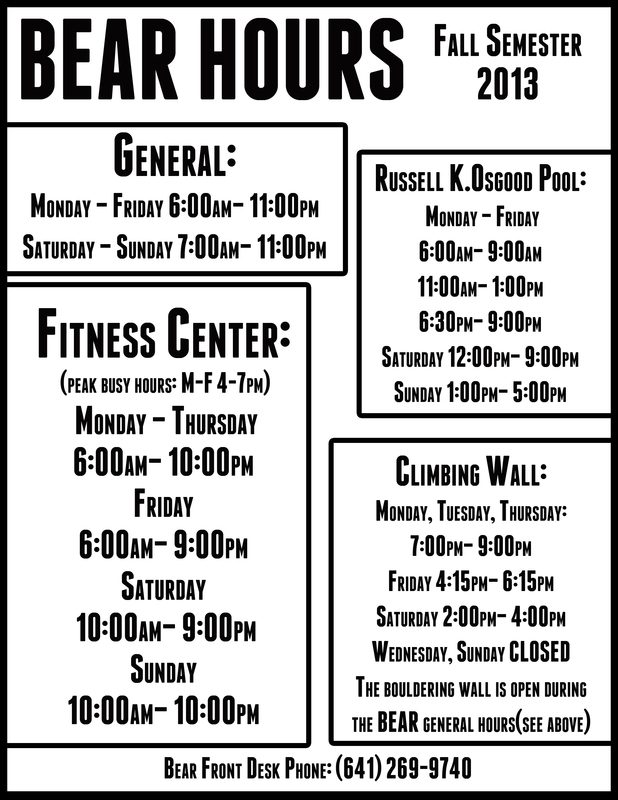 I was also responsible for creating a few handouts to illustrate the Bear’s many offerings. It was an enjoyable evening, and has set up a good prototype for future events. Check out the design work I’ve been up to below! My MAP (Mentored Advanced Project) with Professor Purcell ’92 has taken a dramatic and exciting change in direction. After a few discussions on the goals of my project and on the DIgital Humanities (particularly its emphasis on building things, rather than just discussing things), we’re changing gears. Rather than an ebook, I’ll be creating an app. 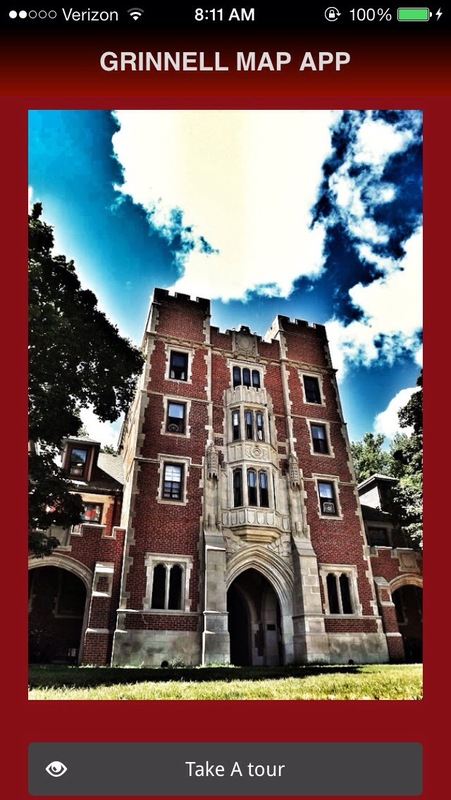 We’re still very early in the planning stages, but essentially the app will provide a guided tour of the campus of Grinnell College and allow the user to “go back in time” to see what buildings once stood on the same ground, notable events that happened in certain buildings, and a wealth of information about each building and its evolutions. It looks to be a massive, but extremely rewarding project. Currently, I’m examining other touring apps, college apps, and various history apps and making prototype mock-ups. More to come on that front as the semester progresses. New logo I designed for the Hall Wellness Coordinators. The six pointed hexagon inside the circle is meant to allude to the Six Dimensions of Wellness. Looking for a good place in town to enjoy a classic Iowa meal with a bit of history? Catch the next train to he Peppertree at the Depot Crossing, on 3rd Avenue and Park Street. The Peppertree resides in the former railroad passenger depot, where the two train tracks through town cross, and the restaurant plays on this history, with a stained glass rendering of a train just inside the front entrance. The beautiful architecture lends to the atmosphere, with original wooden trusses and bricks providing an old-fashioned feeling that simply cannot be duplicated with modern materials. There are a few choices for dining environment: there is the main dining room, the bar area and a small seating area near the bar. The menu is quite extensive and offers something for everyone. There is a good list of appetizers, as well as a selection of soups and small salads. The entrée selection is huge, with a heavy emphasis on meat and seafood. There are also a variety of large salads, pastas and various sandwiches. Most of the pastas, meat dishes and seafood come with bread, salad and a side. Portions are quite sizable at the Peppertree; those with smaller appetites could easily split a meal and be sated. The Peppertree also offers a kid’s menu and various early-bird specials. I had dinner at the Peppertree this past week—here is a peek at a meal there. After perusing the menu and being tempted by the daily dinner special of a rack of ribs, I decided on the Chipotle Chicken Sandwich. Though it came with shoestring fries, I decided to upgrade to seasoned criss-cross fries for 50 cents more. It was totally worth it. The fries were delightfully crisp and deeply flavorful. The sandwich itself was quite huge and ridiculously rich. It featured charbroiled chicken breast, topped with bacon, cheddar cheese, tomato and chipotle mayo, all on thick toasted sourdough bread. The chicken was succulent and the stack of bacon, cheese and tomatoes made the sandwich extra indulgent. The thickly cut and toasted sourdough was a good choice, as it kept the sandwich from falling apart; a lesser bread would not have made it. 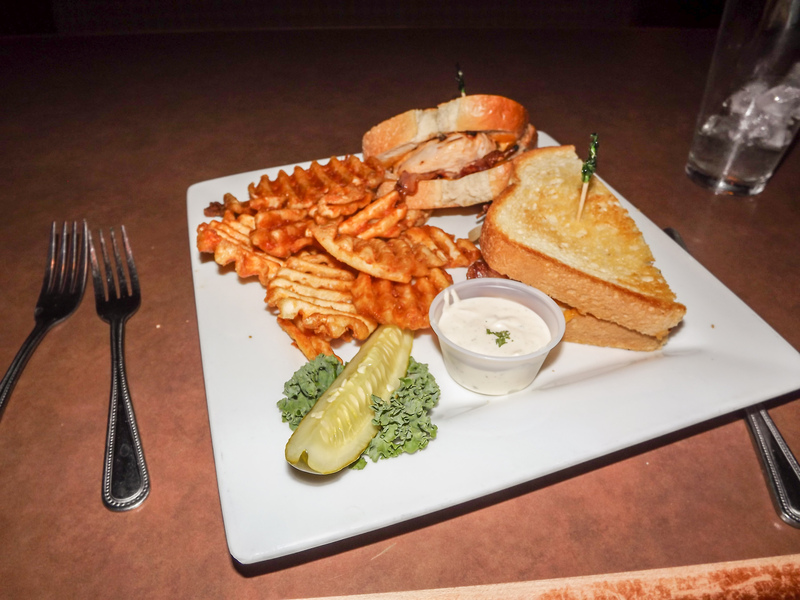 The portions for the meal were quite substantial—I had a generous amount of fries and the sandwich was almost big enough to split. The Peppertree is a great choice for larger groups and definitely has something for everyone to enjoy. The service is attentive, and the location is both historic and fun. If you like trains and great food, then choo-choose the Peppertree for your next dinner. A meal at Relish, located at 834 Park St., is simultaneously steeped in local farm flavors and touches of fine dining. The menu offers a variety of tantalizing choices, from excellent cuts of meat and fresh fish to sandwiches and other vegetarian options. Though Relish is admittedly one of the more expensive restaurants in town, it uses fantastically fresh and local ingredients and the meals are expertly cooked. Lunch provides many of the same options as dinner at a lower price, so definitely consider lunch as an option. It is tough to choose among the many enjoyable options at Relish, but some of the consistent favorites are the Relish Burger, the Chickpea Burger and the Kofta Kabob. Those looking for dessert should definitely check out the Chocolate Oblivion and Chef Kamal’s secret recipe homemade Baklava. Relish is definitely a unique venue with a cozy feel. The homey setting is offset by touches of worldly influence, from the Mediterranean-inspired color scheme inside to the music and unique dishes that accompany one’s meal. Most of the tables are set to seat around four, with a good number of tables for two and a few tables set up for larger groups. There is a small patio section in front of Relish as well, which is ideal on a nice day. To get an idea of the eating experience at Relish, I dropped in for lunch this past week. I started with a small house salad and a bowl of soup with bread. The salad came out first and certainly cemented Relish’s reputation for using local ingredients. Every bit of the salad was fresh and the tomatoes actually came out of the garden in back; that is about as local as food can get. The soup and bread were also superb. The soup du jour was a Cuban Black Bean soup. It was a great balance of spice and flavor, and felt quite substantial for a simple bowl of soup. The bread accompanying the soup was homemade and had great taste and texture. After my rounds of appetizers, I began my main course: Relish’s Chickpea Burger with avocado spread, accompanied by a side of potato medallions. 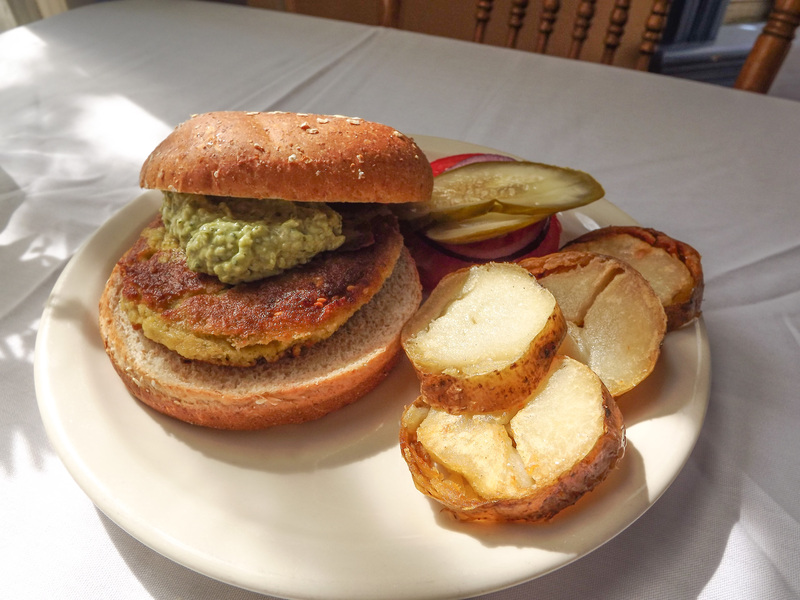 Quite honestly, this is among the best chickpea burgers I have ever tasted. It had excellent texture and benefited from a superb blend of spices that added flavor without overpowering the rest of the burger. The side of potato medallions was surprisingly outstanding; the potatoes had crispy skins and plenty of flavor and crunch that was a nice contrast to the burger. The burger was adorned with an avocado spread that melded superbly with the burger and the bun and added a delectable and subtle aftertaste as the spices from the burger faded. Factor in a phenomenal bun, fresh tomato, lettuce and onion, and a scrumptious side, and this burger is a winner. Relish is ideal for smaller groups, but can easily accommodate a large group in the main dining room with enough notice. For those looking for an interesting, worldly meal with an infusion of local ingredients, Relish is exactly the place to be. The atmosphere lends itself to great meals and conversation, and the cooking is fantastic. Relish is ready to be relished! In the middle of downtown Grinnell this weekend, an ancient Japanese art form will create incredibly unique pottery pieces. The art form is called Raku and it is a traditional style of pottery glazing that originated in 16th century Japan. This Saturday, attendees will be able to try it out and take home their own glazed pieces. The Grinnell Area Arts Council (GAAC) is hosting a Raku Workshop this Saturday from 9 a.m. to 3 p.m. at the downtown Grinnell Arts Center on 926 Broad St. Attendees will be able to purchase ceramic pots to glaze and have Raku-fired. Purchasing a pot includes all of the brushes and glazes needed to complete the glazing, in addition to the experience itself. The process for attendees is relatively simple. One simply needs to show up, purchase a pot to glaze for $5-15, glaze the pot and hand it over to the event organizers. “We bring two potters in from South Dakota, Tom and Wanda Clark, and they bring two kilns to do firings for the community,” said GAAC Arts Director Mary Rellergert ’13. Raku is an interesting style of glazing because the results are relatively unpredictable. “It uses both fire and smoke to create effects on the ceramic surface. You never know exactly how it will turn out, which is part of the fun,” Rellergert said. Some of the most popular Raku glazes are an iridescent blend of earthy colors and a striking combination of black lines on white glaze caused by attaching horsehair to the surface before firing. While most pottery glazings take hours to complete and cool down, the Raku process is comparatively quick. 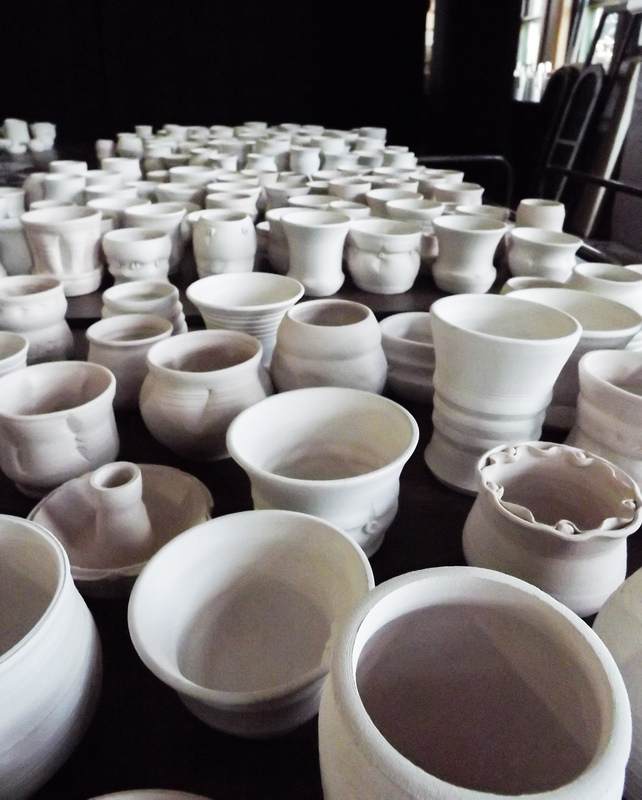 The entire process of glazing and firing the pot should take less than three hours total. The pot can be taken home the same day as the event. The Raku firings have been a popular event for the Grinnell Area Arts Council for a long time. The auction will include a range of impressive artwork from both past and present community members. Other attractions at the art fair include a face painting booth and a writing station with a resident of Grin City Collective. The event will proceed rain or shine, and the activities will be tented in the event of showers. It is well worth taking a few hours out of one’s Saturday to see the Raku firings and participate. It is one of the most interesting art processes to see firsthand. “You can watch them put the pot in the fire and watch it transform before your very eyes. It’s pretty cool,” Rellergert said. 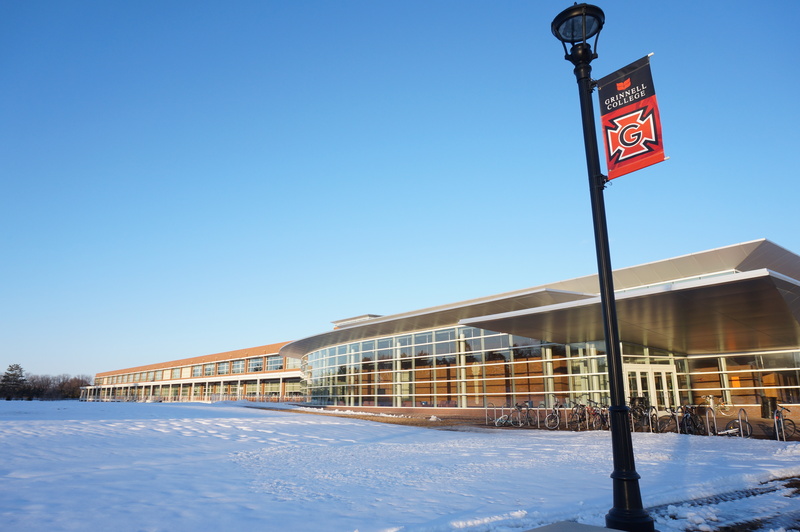 The Dining Hall has more to offer than the options you’ll find listed on the menu. There are countless ingredient options and permutations of your favorite foods that can yield deliciously delightful dishes. With a little bit more work, some creativity and plentiful use of the various ingredients scattered throughout the Dining Hall, every meal becomes an adventure. You will never have to complain that there is nothing good to eat at a particular meal. With practice, you’ll begin to see unique combinations each time you seek out food and you will soon create a plethora of amazing meals. We’ll get started with an easy dish to make at every meal. Breakfast can be notoriously difficult to find something new to eat. If the Eggs-to-Order line seems longer than your most boring class, you’re not going to want to get eggs. This usually leaves bagels, pastries, cereal, waffles and the occasional plat du jour item. 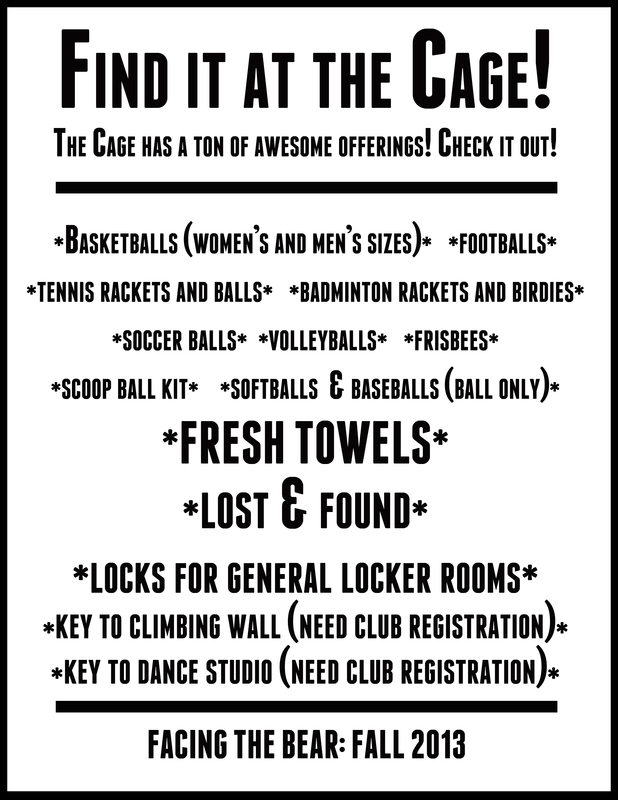 While these options can be pretty enjoyable, day after day of the same item can get tedious. I suggest making a little something I call Power Oatmeal. I like to start by grabbing a large bowl (the ones for stir-fry vegetables hold the most volume) and filling it about halfway with oatmeal. Skip over to the area to the right of pizza that has the peanut butter and cream cheese. Add in a large scoop of peanut butter, a small dollop of cream cheese, and a generous squeeze of honey. Next, head over to the microwave and spice rack. I add cinnamon (tons! ), nutmeg, cinnamon sugar and a pinch of kosher salt, then I toss it into the microwave for about 30-40 seconds. The honey will boil and melt the cream cheese and peanut butter. Remove the (HOT) bowl from the microwave, stir until the ingredients are well mixed. At this point, you can enjoy your deliciously nutritious oatmeal, but I like to add a scoop of vanilla yogurt to the mix for added creaminess. Another great add-in is fruit from the waffle bar; have them toss in some fruit while the waffles are cooking. This is a simple, quick dish that will get you through all of your morning classes and also tastes delicious. Lunch is a tricky time to navigate the Dining Hall. Most of us have a more limited time schedule during lunch, so finding food quickly is key. This time, we’ll make a delicious bagel pizza. Start by grabbing a small bowl from the stir fry station and take it over to the quick pasta line; have them fill it with marinara sauce. Snag a bagel and toast it while you add a touch of cream cheese to your marinara. Grab your toasted bagel and head over to the salad bar for toppings. I like to add fresh spinach, peppers, mushrooms and a sprinkling of cheese to my bagel pizza. Take your ingredients over to the microwave area and assemble your two bagel halves into pizzas. I layer it (from bottom to top): bagel, sauce, vegetable toppings, sauce, cheese and seasonings. I season my pizzas with the Italian seasonings, chili powder and cajun spices. Microwave for about 20-30 seconds and enjoy! This is quick, easy and scrumptious. Dinner is a great time to relax and explore the Dining Hall for ingredients and combinations. One of my favorites is a Baked Ziti Doppelganger. It’s surprisingly easy to create. Snag a bowl of marinara sauce and a bowl of pasta from the pasta bar. Add a large spoonful of cream cheese, a scoop of mozzarella cheese, two small spoons of balsamic vinegar (by salad bar) and some Italian seasonings to your marinara sauce, then microwave for about 20 seconds. Mix thoroughly and pour over the pasta. Enjoy the happiness that comes with a delicious pasta sauce. The Dining Hall is a playground, filled with ingredients just ready to be made into amazing dishes. If you think about what you are eating, if you take the time to craft something worth indulging in, if you make every meal a masterpiece, then your life will be better for it. Don’t just eat to live, live to eat. 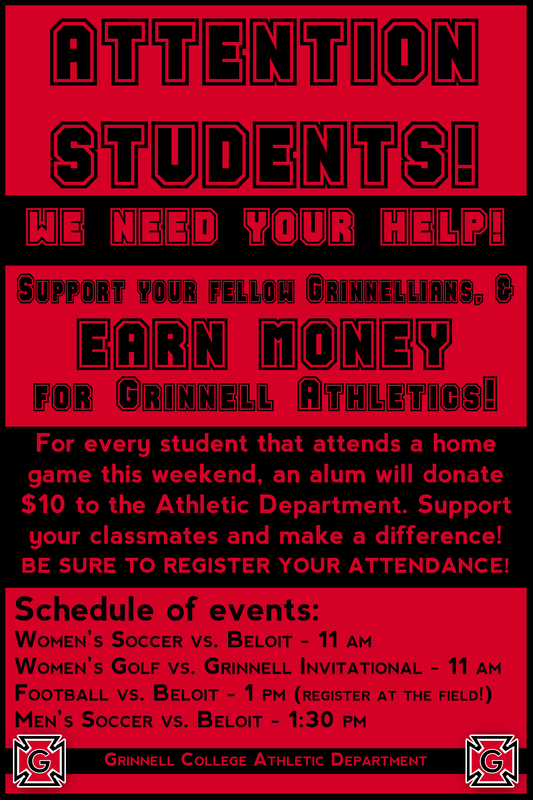 You stay classy, Grinnell. McNally’s Foods, a downtown Grinnell staple for decades, has opened a new location on the corner of 6th Avenue and Main Street. The new store contains more merchandise, a seating area and an expanded deli with hot food options. With an old-school, local grocer atmosphere coupled with modern amenities and services, the new McNally’s is proving to be an exciting change to Grinnell’s Main Street. It has been quite a journey over the past few months for owners Randy and Julie Smith. The couple decided to move last winter when their landlord at the previous location decided to double the rent. “We saw that we either had to move or quit,” Mr. Smith said. They debated the different options and concluded that they wanted to keep running McNally’s, one way or another. “We knew we wanted to continue to serve the community. We decided that staying in that location was not in the best interest of the store, ourselves or our employees, so we decided to see what else was available,” Ms. Smith said. As luck would have it, an ideal space had opened up across the street. With a new space chosen and a move imminent, the Smiths set about designing their new store. “Basically, we sat down with a piece of paper and thought about if we could design our dream store, what would we put in it?” Ms. Smith said. This led to a relatively simple drawing they still keep in the business’s office, a drawing that closely resembles the new McNally’s. They then worked with a designer to transform their ideas into the blueprints of the space. With only a few months left to plan and move their store, the Smiths had to act quickly. Luckily, everything started to fall into place with teams of engineers, contractors and suppliers working together to get the new space set for opening. As they built into and refinished the new space, the Smiths encountered some hidden details that made the space an even more perfect fit. “As the electricians started working in the drop ceiling, they found some of the original trusses. 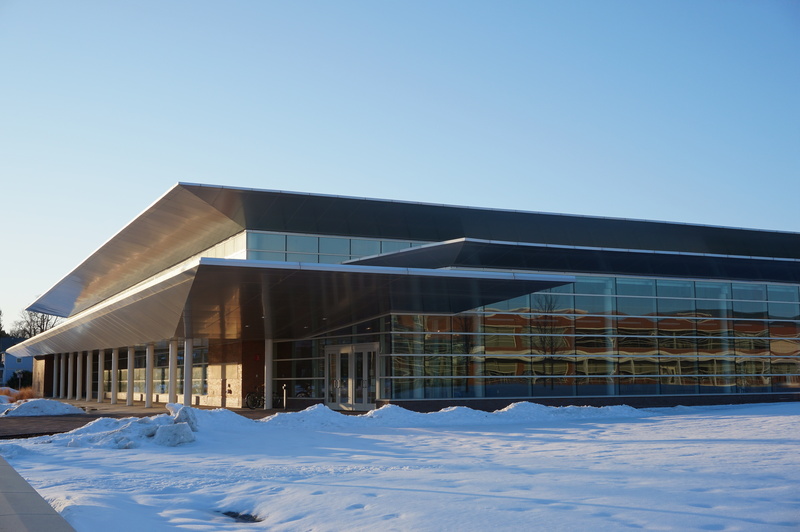 We thought they were so beautiful and went with the spirit of the building that we thought it would be a shame to keep them hidden,” Ms. Smith said. The trusses add to the old-time environment that the new McNally’s has cultivated. Another key component of this atmosphere is the featured showpiece: a 1922 Model T “Huckster” that sits just inside the entryway. 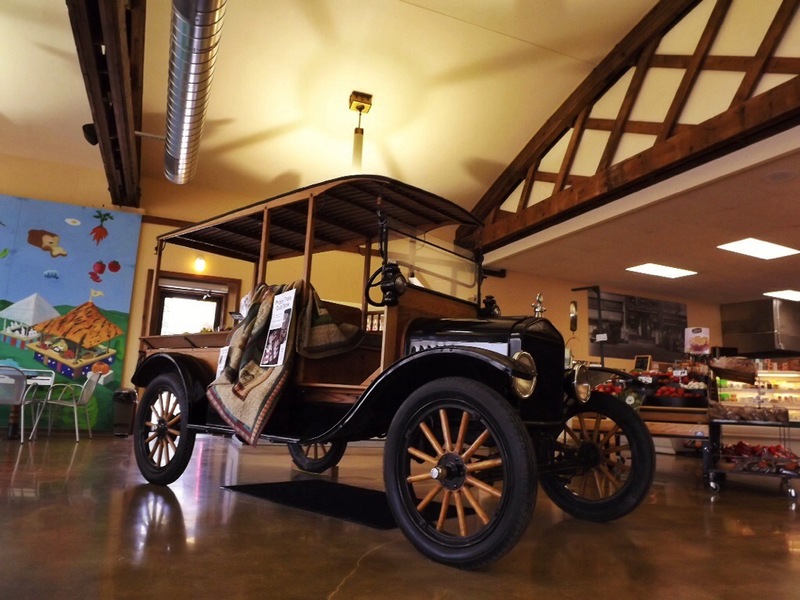 The Model T is a throwback to the original use of the space as a Ford dealership back in the 1920s. The old car is not just for show either. “It actually runs. We drove around town, honked the horn, and drove it into the store,” Ms. Smith said. The final move over was an experience in and of itself. “The Sunday before we moved, we started taking things over in carts and everyone got involved. We had all sorts of people here. We had lots of community members here, we had students, we even had the mayor here,” Ms. Smith said. The move took about two days, and then the Smiths placed a huge order with their supplier to fill in the remaining shelves with new items. So far, the new store setup and its many amenities are proving popular with students, especially the seating area in the front where customers can enjoy food and drinks. “I love the new store, I just feel so comfortable there. 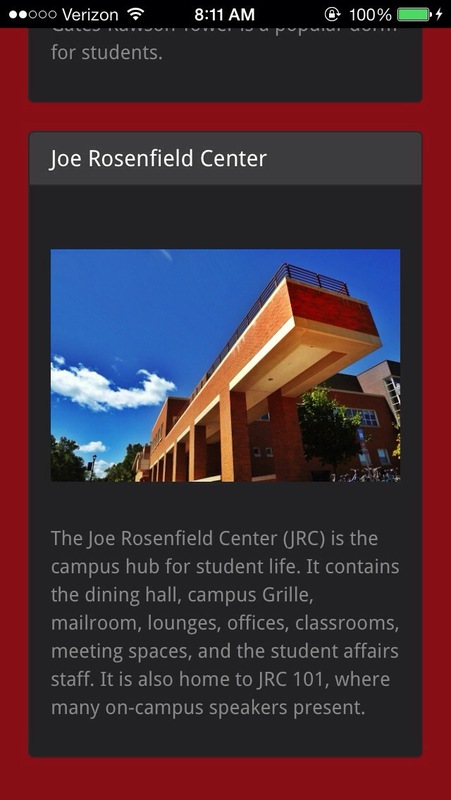 I can see myself studying and relaxing there, especially with that new eating area,” said Kristina De La Torre ’14. This past week, a poster caught my eye as I left my advisor's office. It advertised a free drawing class this weekend on the prairie with artist Tara Shulka, whose artwork is currently on display in the Smith Gallery at Grinnell. Not one to miss a chance for free art lessons, I signed up! 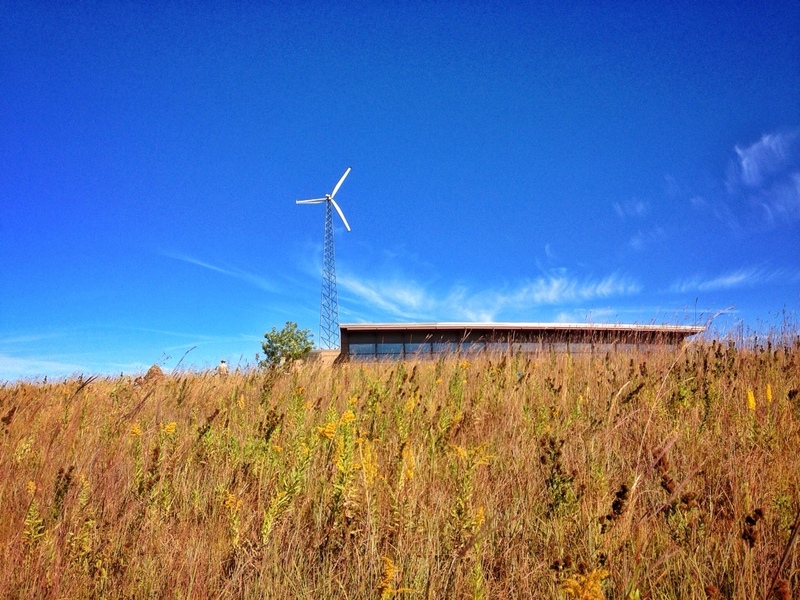 This morning, about twelve of us hopped onto the shuttle to CERA (the Conard Environmental Research Area), a huge plot of natural prairie the college owns and uses as an outdoor classroom/research area. 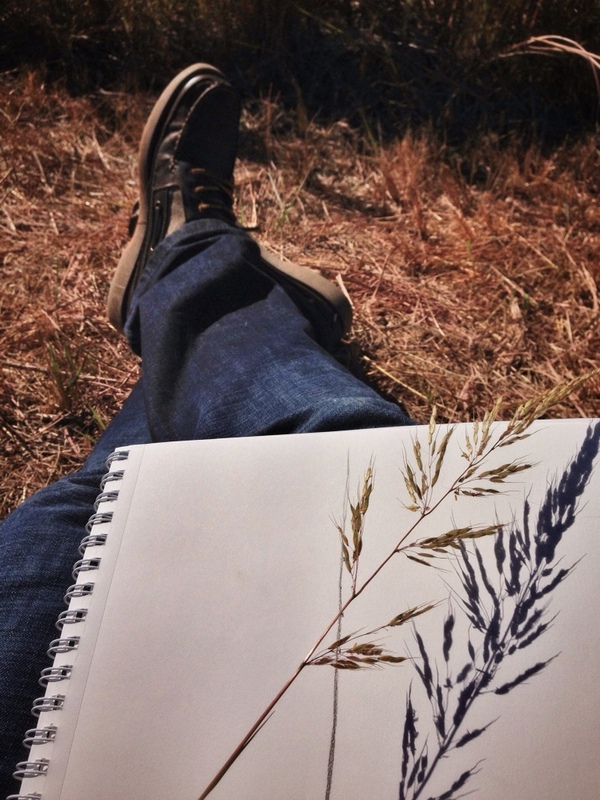 We spent the morning learning some drawing practices, doing a few blind contour drawings, walking among the prairie plants, and working on a detailed drawing. It was a really enjoyable experience; Tara was an excellent and patient instructor, and my “classmates” and I shared some great conversation as we worked. 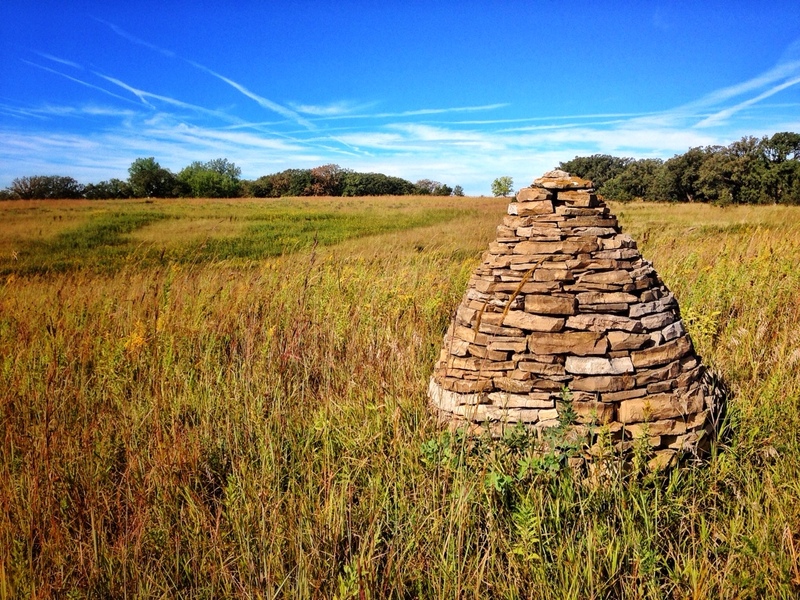 It was also perfect weather, which made the prairie even more breathtakingly beautiful. We finished the morning with a delicious box lunch, and then rode the shuttle back to campus. It was a great experience, and certainly a good use of a Saturday morning! Enjoy some pictures below!